// Between the lines //: Egg-free Chocolate Chip Cookies!! Since we moved to Paris, there is no incentive for baking our own bread anymore. We have at least ten bakeries within close walking distance...and the bread here is SO good - what did I say? Outrageously good! However, we had one limitation: no eggs! no nuts! - as one of our girls was diagnosed with a severe egg and nut allergy when she was about six months old. As most baking recipes call for eggs, baking cookies was quite a challenge at the beginning. That is, until I found out about EnerG's Egg Replacer. It took a while to get the dosage right, but once that problem solved, we could make just about everything - and I believe I can say no one ever noticed there weren't any eggs involved! Baking became a fun activity with the kids. Especially little H. enjoyed our baking sessions. The absolute favorite were our egg-free chocolate chip cookies. The recipe below is an adaptation from a Martha recipe - tried-and-true! Instead of using water to dissolve the egg-replacer, as suggested on the box, I use milk - something I do for most baking recipes. Also, the egg-replacer tends to color down the cookies a bit, so I've replaced part of the granulated sugar by light brown sugar. Depending on your oven, you might also want to increase the baking time a bit. Just keep an eye on them as they bake! A batch of these usually doesn't last long, here! 1. Preheat oven to 350°F (175-180°C). Whisk together flour, salt and baking soda in a small bowl; set aside. In a separate bowl beat together on medium speed butter and sugars until pale and fluffy, about 2 minutes. Reduce to low speed and add vanilla and dissolved egg-replacer; mix until well combined, about 1 minute. Add flour mixture; mix until just combined. If necessary, add more milk, one tablespoon at a time and no more than two. Stir in chocolate chips. 2. Drop heaping tablespoons of dough onto baking sheets lined with parchment paper, spacing 2 inches apart. Bake cookies, rotating sheets halfway through baking time, until centers are set and edges are golden, about 10 to 12 minutes. Let cool on baking sheets 2 minutes. 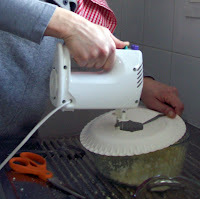 Transfer cookies to wire racks using a spatula; let cool completely. Cookies can be stored in an air-tight container at room temperature up to 1 week (but they usually don’t last that long…). Disclaimer: Before starting, make sure to check all the labels of all ingredients you're about to use for the presence of possible allergens! !